This name uses Spanish naming customs: the first or paternal family name is Gasol and the second or maternal family name is Sáez. Pau Gasol was born in Barcelona. His parents both played basketball in organized leagues. His father, Agusti, stood 6 feet 3 inches (1.91 m), and his mother, Marisa, was 6 feet 1 inch (1.85 m). Gasol began playing basketball as a center with his school team, Llor, and he eventually signed with Cornellà. When he was sixteen, he began playing for Barcelona's junior team. He also won both the 1998 Albert Schweitzer Tournament and the 1998 FIBA Europe Under-18 Championship. After moving to the senior team of Barcelona, Gasol played just 25 total minutes in the Spanish ACB League's 1998–99 season, and averaged 13.7 minutes per game in the ACB the next year. However, in his final season in the ACB, Gasol averaged 12.4 points and 5.8 rebounds in 24.7 minutes per game. Barcelona was victorious in the Spanish National Cup finals championship game in 2001, and Gasol was named Most Valuable Player. After entering the NBA draft, Gasol was selected third overall in the first round in the 2001 NBA draft by the Atlanta Hawks, who traded his draft rights to the Memphis Grizzlies in exchange for Shareef Abdur-Rahim. 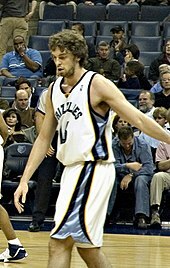 In his first season with the Grizzlies, Gasol became the first foreign player to win the NBA Rookie of the Year Award, and was named to the NBA All-Rookie First Team. He averaged 17.6 points and 8.9 rebounds per game, and was also the only team member to play in all 82 games that season. Gasol led the team in scoring (19.0 points per game) in his second year with the Grizzlies, and for the second year in a row, played in all 82 games. 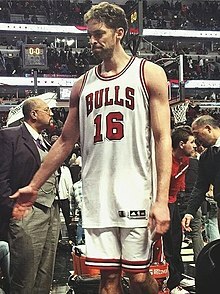 Gasol missed the first game of his career, during his third year, with a foot injury on April 5, 2004, which snapped his string of 240 consecutive games played. He grabbed the 1,500th rebound of his career on November 12, 2003, against the Orlando Magic and scored his 3,000th career point on October 31, 2003, against the Boston Celtics. Despite having 22 points in Game 4 against the San Antonio Spurs, the highest by a Memphis players in the playoffs, his team was eliminated in the first round, not winning a single game against San Antonio. This was both the Grizzlies and Gasol's first trip to the NBA Playoffs. He scored 31 points and blocked four shots on January 11, 2005, against the Indiana Pacers to earn 5,000 points and 500 blocks in his career, becoming the 10th fastest player to reach 5,000 points/500 blocks since 1973–74. He also helped his team make it to the playoffs for the second time in his career, but they were eliminated in the first round and did not win a single game against the Phoenix Suns. In his fifth year with the Grizzlies, he became the franchise's all-time leading rebounder on March 24 against the New York Knicks when he grabbed his 3,072nd rebound in a Grizzlies uniform. He made 29 consecutive free throw attempts from January 24 to 28, tying the second best mark in Grizzlies history, including two straight games going 12–12 from the line, tying the best single-game mark in franchise history. Gasol and the Grizzlies returned to the playoffs for the third time in his and his team's history. Once again, they were eliminated in the first round and did not win a single game against the Dallas Mavericks. 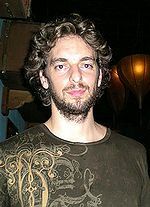 Gasol missed the first 23 games of the 2006–07 NBA season due to a broken foot suffered near the end of Spain's semifinal win over Argentina in the 2006 FIBA World Championship. He would go on to be named Most Valuable Player of the tournament, which Spain won. He had a season-high 34 points (most by a Grizzly that season), and eight rebounds and tied a career-high and franchise record with eight blocks on January 29 against the Sacramento Kings, and surpassed Shareef Abdur-Rahim as the franchise's all-time leader in free throw attempts on January 31 against the Dallas Mavericks. He became the all-time franchise leader in field goals made on February 6 against the Houston Rockets, and became the all-time franchise leader in minutes played on February 7 at Dallas. He surpassed Shareef Abdur-Rahim (7,801 points) as the Grizzlies' all-time leading scorer on March 7, 2007, against the Toronto Raptors (7,809 points at the time). On January 24, 2007, Gasol recorded his second career triple-double against the hosting Utah Jazz, garnering 17 points, 13 rebounds, and 12 assists. He also registered 2 blocks and one steal. On February 1, 2008, Memphis traded Gasol to the Los Angeles Lakers along with a 2010 second round draft pick for Kwame Brown, Javaris Crittenton, Aaron McKie, the rights to Marc Gasol (Pau's younger brother), and 2008 and 2010 first round draft picks. There has been some controversy surrounding the trade. Chris Wallace denied in an ESPN article that he had been ordered by owner Michael Heisley to make the Grizzlies more attractive to a potential buyer. Wallace said, "No one put pressure on me to do this, and Michael Heisley has actually been reluctant to move Pau." He also said that they had been "trolling" the waters for a while and dealt with a number of teams. He selected the Lakers deal because "it didn't get any better than this." When Gasol departed the Grizzlies, he held twelve franchise records, including games played, minutes played, field goals made, free throws made and attempted, offensive, defensive, and total rebounds, blocked shots, turnovers, and points. Per game statistics, he leads Memphis in defensive and total rebounds along with blocked shots. On February 5, Gasol made his first Lakers appearance in a game against the New Jersey Nets, during which he scored 24 points and had 12 rebounds in a 105–90 win over the Nets. On March 14, Gasol sprained his ankle in a game against the New Orleans Hornets, stepping on the foot of teammate Vladimir Radmanović in the first quarter. Gasol was expected to miss the remaining three games of the Lakers' road trip after x-rays came up negative. Gasol returned to the starting lineup on April 2 against the Portland Trail Blazers and played nearly thirty-two minutes, registering 10 points, six rebounds and seven assists. He admitted to feeling limited with the swelling in his ankle still present. Gasol helped the Lakers finish the regular season with the best record in the Western Conference (57–25), with him in the starting lineup the Lakers went 22–5. Kobe Bryant has also stated that playing with Gasol clicked from the start. In the Lakers' opening game of the playoffs, he contributed 36 points, 16 rebounds, 8 assists and 3 blocked shots. When the Lakers swept the Denver Nuggets in the first round, it was Gasol's first trip to the second round in four tries. His previous team, the Grizzlies, failed to reach the playoffs for the second year in a row. He contributed 17 points and 13 rebounds in Game 6 against the Utah Jazz to help the Lakers advance to the conference finals. On May 31, he recorded a career high 19 rebounds in a series-clinching win against the San Antonio Spurs, and he became the first Spaniard to reach the NBA Finals. 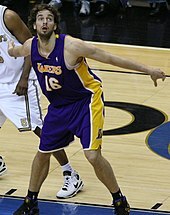 Gasol scored 14.7 points per game on .532 shooting in the 2008 Finals against the Boston Celtics, which was below his scoring average of 18.9 during the regular season, However, he led the Lakers in rebounding with 10.2 per game throughout the championship series, up from his regular-season average of 8.4. Los Angeles lost in six games against Boston in the Finals, including a 131–92 loss in Game 6. In the Playoffs, Gasol was the second leading Laker in points (16.9), rebounds (9.3) and assists per game (4.0). He was the leader in blocks per game (1.90) and was tied with Lamar Odom with the most postseason double-doubles (10). On January 2, 2009, in a win against the Utah Jazz, Gasol scored his 10,000th career point. Gasol earned his second All-Star appearance as a reserve for the Western Conference squad during the 2008–09 NBA season, his first as a Laker. He was also named Western Conference Player of the Month after helping the Lakers to an 11–2 record for the month of February that included road wins over Boston and Cleveland. He finished the regular season with averages of 18.9 points, 9.6 rebounds, 3.5 assists, and 1 block per game. Gasol then won his first NBA championship ring when the Lakers defeated the Orlando Magic in the 2009 Finals. On December 24, 2009, Gasol signed a 3-year extension with the Lakers worth $64.7 million. Gasol earned his third All-Star appearance as a reserve for the Western Conference and finished the regular season with averages of 18.3 points, 11.3 rebounds, 3.4 assists, and 1.7 blocks. In Game 6 of the first round, Gasol grabbed 18 rebounds and his last-second putback eliminated the Oklahoma City Thunder. In the conference semifinals against the Utah Jazz, he averaged 23.5 points and 14.5 rebounds, and finally in the conference finals against the Phoenix Suns, he averaged 19.7 points with 7.2 rebounds. 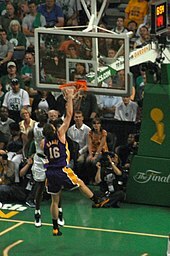 In Game 7 of the NBA Finals against the Boston Celtics, Gasol scored 19 points, (6–16 FGM-A, 7–13 FTM-A) grabbed 18 rebounds and recorded two blocks as the Lakers repeated as champions. In 2010, he was chosen as the 15th-smartest athlete in sports by Sporting News. Challenged by Lakers' coach Phil Jackson to be more assertive while Bryant recovered from offseason knee surgery, Gasol started the season's first week averaging 25.3 points on 52.5 percent shooting, 10.3 rebounds, and five assists per game as the Lakers started 3–0. He was named Western Conference Player of the Week. He earned his third straight All-Star selection and his season averages of 19 points and 10 rebounds were nearly identical to what he had put up as a Laker the previous three seasons. Pau's play also merited him All-NBA second team honors for the first time in his career. In the playoffs, Gasol only averaged 13 points on 42% shooting over 10 games, and the Lakers were swept by the Dallas Mavericks in the second round. Gasol had the worst post season performance of his career. Lakers Hall of Famer and ESPN analyst Magic Johnson cited Gasol as a possible trade option for the Lakers to acquire Magic center Dwight Howard. Gasol ignored the false reports about his relationship status with his girlfriend as the cause of his poor performance and has accepted the criticism of his play as valid. During the 2011–12 NBA season, Gasol and teammate Lamar Odom were subjected to trade rumors involving former New Orleans Hornets guard Chris Paul. After the trade fell through, Gasol vowed that it would not affect the way he played. Odom, on the other hand, was angry at the Laker organization and was traded to the 2010–11 NBA champion Dallas Mavericks for a future first round pick. After Lakers co-captain Derek Fisher was traded in March 2012, Gasol joined Bryant as co-captains of the team. He won the 2011–12 seasonlong NBA Community Assist Award. After a 1–4 start to the 2012–13 season, the Lakers replaced head coach Mike Brown with Mike D'Antoni. Gasol was struggling after seven games under D'Antoni, averaging 10.1 points and 8.0 rebounds while shooting 38.8 percent, and he was benched in the fourth quarter in multiple games. The team had difficulties getting Gasol involved in D'Antoni's offense, which historically had not had post players playing forward. Gasol ranked only 27th in the league in post-up points with 2.7 per game, down from prior seasons when he was fifth in 2010–11 and ninth in 2011–12. On November 18, 2012, in a win against the Houston Rockets, Gasol scored his 15,000th career point. Bothered by tendinitis in both knees since training camp, Gasol sat out eight games in December before returning to the starting lineup. Later, he was diagnosed with plantar fasciitis, but continued playing. General manager Mitch Kupchak told Lakers season-ticket holders the team needed Gasol to be more involved. On January 7, 2013, Gasol received a blow to the face from Denver's JaVale McGee in the fourth quarter of a 112–105 loss. He suffered a concussion, forcing him to miss the next five games. In his first game back, he came off the bench after having started his first 345 games with the Lakers. In the next game, he returned to the starting lineup and scored 25 points against Toronto, only his second 20-point game of the season. However, in the next game on January 21, D'Antoni moved Gasol to a reserve role and started Earl Clark, a change the coach considered permanent. On February 5 against the Brooklyn Nets, Gasol tore the plantar fascia of his right foot. Gasol had tweaked the fascia in the first half, but played through the soreness until he felt it pop when he tried to block a shot by Brook Lopez towards the end of the game. He returned over six weeks later on March 22 after missing 20 games, with D'Antoni returning him to the starting lineup over Clark. After a two-game adjustment period, Gasol's play was solid, and Bryant insisted that Gasol receive the ball in the post. D'Antoni stated that Gasol had played well since January, and attributed the forward's earlier struggles to injuries and the team's evolving offensive system. "I have a lot more confidence in him now, and he's playing great", D'Antoni said. He finished the season with career lows in points (13.7) and field-goal percentage (.466), and his rebounds (8.6) were his lowest since his first season with Los Angeles. He was limited to career-low 49 games. However, he had three triple-doubles in his last seven games including the playoffs. Gasol was owed $19.3 million in 2013–14 in the final year of his contract, which would cost the Lakers around $50 million including luxury taxes. He became a free agent after the season. Gasol with the Bulls in 2015. On July 18, 2014, Gasol signed with the Chicago Bulls. He said after he was introduced: "It was a gut feeling. I thought Chicago was going to be the best fit for me. It's a great challenge, but I'm driven by challenge. I look forward to it." On January 1, 2015, Gasol recorded a career-high 9 blocks, along with 17 points and 9 rebounds, in the 106–101 win over the Denver Nuggets. Ten days later, he scored a career-high 46 points on 17-of-30 shooting in a 95–87 win over the Milwaukee Bucks. On April 9, 2015, he recorded a league-best 51st double-double of the season with 16 points and 15 rebounds in an 89–78 win over the Miami Heat. He recorded his 54th double-double of the season in the regular season finale on April 15 against the Atlanta Hawks to finish as the league-leader in double-doubles in 2014–15. On December 5, 2015, Gasol became the 116th player to reach 1,000 regular-season games. He had 13 points and 11 rebounds against the Charlotte Hornets for his ninth double-double of the season. On January 25, 2016, he recorded his first career first quarter double-double with 13 points and 10 rebounds. He finished the game with 19 points and 17 rebounds, as the Bulls were defeated by the Miami Heat 89–84. On February 9, Gasol was named as Jimmy Butler's replacement on the 2016 Eastern Conference All-Star squad. On February 27, he recorded his eighth career triple-double and first as a Bull with 22 points, 16 rebounds and a career-high 14 assists in a 103–95 loss to the Portland Trail Blazers. At 35 years old, he became the oldest player to record a triple-double since Kobe Bryant did so at 36 years old in 2014. On March 7, he recorded his second triple-double of the season with 12 points, 17 rebounds and 13 assists in a 100–90 win over the Milwaukee Bucks, becoming just the fourth player 35 years or older with multiple triple-doubles in a season, joining Jason Kidd, Kobe Bryant and Paul Pierce. On April 2, in a loss to the Detroit Pistons, he became the 38th NBA player to reach 10,000 career rebounds. He also became the 36th with 10,000 points and 10,000 rebounds. On July 14, 2016, Gasol signed with the San Antonio Spurs. On November 11, 2016, he had season highs with 21 points and six assists in a 96–86 win over the Detroit Pistons. On January 19, 2017, he was ruled out indefinitely after breaking his left ring finger during pregame warmups earlier that night. He underwent surgery the following day to repair a fracture of his left fourth metacarpal. On February 24, 2017, in a 105–97 win over the Los Angeles Clippers, Gasol had 17 points and 11 rebounds off the bench in his return from a 15-game absence because of the finger injury. On April 12, 2017, Gasol scored 13 points to reach 20,000 career points in a 101–97 regular-season finale loss against the Utah Jazz, becoming the second European player to reach the mark after Dirk Nowitzki. On July 24, 2017, Gasol re-signed with the Spurs. On December 20, 2017, he had 20 points and a season-high 17 rebounds in a 93–91 win over the Portland Trail Blazers. On December 23, 2017, he recorded his 10th career triple-double with 14 points, 11 rebounds and a season-high 10 assists in a 108–99 win over the Sacramento Kings. On December 26, 2017, in a 109–97 win over the Brooklyn Nets, Gasol collected his 10,817th rebound, moving him past Jack Sikma for 30th in league history. On January 26, 2018, in a 97–78 loss to the Philadelphia 76ers, Gasol became the 34th player in NBA history to play 40,000 career minutes. On March 25, 2018, he had 22 points on 10-of-15 shooting and grabbed 13 rebounds in a 106–103 loss to the Milwaukee Bucks. After appearing in the first nine games of the 2018–19 season, Gasol missed the next 26 games with a stress fracture in his right foot. On March 1, 2019, he was released by the Spurs in a buyout agreement. On March 3, 2019, Gasol signed with the Milwaukee Bucks. On March 23, he was ruled out for a month with a left ankle injury. Gasol's first competition with the senior Spain national basketball team was the 2001 EuroBasket tournament, after having previously won the 1998 FIBA Europe Under-18 Championship and 1999 FIBA Under-19 World Championship with the Spanish junior teams. Being considered, against his own will, the leader of the team, Gasol ended up with the bronze medal in the competition. Gasol has since had much success with the Spanish team, winning the 2006 FIBA World Championship and the 2009 and 2011 EuroBasket tournaments, being chosen as the Most Valuable Player in the first two; he also won silver medals at the 2003 and 2007 EuroBasket, and the 2008 and 2012 Olympic Games. Gasol was also the highest-scoring player of the 2004 Summer Olympics, and Spain's flag bearer at the opening ceremony of the 2012 Summer Olympics, replacing the injured Rafael Nadal. In 2014, Gasol was named to the All-tournament team of the 2014 FIBA Basketball World Cup. 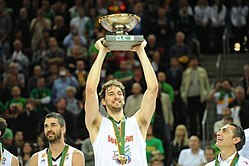 In the 2015 EuroBasket, Gasol was named the MVP of the competition, after some amazing performances, averaging 25.6 points and 8.8 rebounds per game (he was the competition leader for points per game, and 4th in rebounds per game). During the knockout matches of the competition, Gasol inspired the Spanish side which was missing many of its stars like Ricky Rubio, Juan Carlos Navarro, Álex Abrines, and his brother Marc Gasol. Gasol scored 40 points in the semifinal against France, which was half of his team's points. The 35-year-old player was also named the competition's leader for blocked shots per game (2.3). On September 7, 2017, in a game against Hungary, Gasol became FIBA EuroBasket's all-time leading scorer, passing Tony Parker with 1,033 points. He ended up at 1,183 total points scored at the EuroBasket. Gasol is athletic for a 7-footer (213 cm), allowing him to play both the power forward and center positions, much like fellow European players Toni Kukoč and Dirk Nowitzki. He is a refined scorer in the post and midrange; his overall game is near-ambidextrous and makes it difficult for opposing teams to defend. Gasol uses a variety of midrange jumpers, hook shots, up-and-under moves, and shot fakes to score very efficiently. In addition, his foot speed relative to his size allows him to run the fast break and finish effectively. He is also a skilled passer for a big man, earning 3.2 assists per game over his career. Defensively, he is an above-average shot blocker with a career average of 1.7 blocks per game. Former Lakers teammate Kobe Bryant said of Gasol, "You'd be hard-pressed to find a big [man] with his skill set in the history of the game." Gasol is a double-double machine, having recorded over 550 double-doubles in his NBA career. On April 2, 2016, he became the 36th player in NBA history to reach the 10,000-point/10,000-rebound mark. While Gasol became the 43rd player in NBA history to reach to the 20,000-point milestone, he is just the fourth with that many points, 10,000 rebounds, 3,500 assists and 1,500 blocks. Gasol's mother, Marisa, was a medical doctor, and his father, Agustí, was a nurse administrator. When Pau was born, his family was living in Cornellà, but he was born in Barcelona, at Sant Pau Hospital, where both of his parents worked. When he was 6 years old, his family moved to another Barcelona suburb, Sant Boi de Llobregat, where he spent the remainder of his childhood. His parents moved to the Memphis suburb of Germantown, Tennessee, after he signed with the Grizzlies, and enrolled his younger brothers Marc and Adrià in Lausanne Collegiate School in Memphis. They planned to move to the Los Angeles area when Pau was traded to the Lakers, with Agustí accepting a job with a health-care company in that area; although the Grizzlies obtained the rights to Marc's services as part of the trade, he was expected to re-sign with his Spanish team Akasvayu Girona. However, when Marc decided to sign with the Grizzlies, their parents chose to stay in Germantown. Agustí now works from home for the same company, while Marisa now volunteers at St. Jude Children's Research Hospital. After being traded to the Lakers, Gasol lived in Redondo Beach, across the street from the shoreline. In 2009, Gasol, along with several other NBA players, joined the "Hoops for St. Jude" charity program benefitting the St. Jude Children's Research Hospital. Gasol was interested in football, but loved basketball. The first sport he played was actually rugby, before switching to basketball. He is described as "a family boy and the perfect student, a tad shy, and a bit of a joker." He originally did not want to make sports his career. On the day that Magic Johnson announced his HIV-positive status in 1991, the 11-year-old Gasol, who had heard the news in school, decided that he wanted to be a doctor and find a cure for AIDS. He enrolled in medical school at the University of Barcelona, but left as his basketball career at FC Barcelona advanced. He remains strongly interested in medicine. Gasol regularly visits Childrens Hospital of Los Angeles, a standard stop for athletes making charitable visits in the L.A. area, but does not limit his business to visiting young patients. On one visit, he asked a group of doctors well-informed questions about their treatment of children with scoliosis. In April 2010, Gasol was scheduled to sit in on a spinal surgery, wearing surgical scrubs, with Dr. David Skaggs, the hospital's chief of orthopedic surgery. Skaggs has said, "We talk to him now almost like he is a surgical colleague." Gasol canceled his original plans to observe a surgery when he came down with a low-grade fever the day before the operation, not wishing to risk infecting anyone at the hospital. He was able to reschedule his observation for June 2010, witnessing Skaggs lead a team operating on a 13-year-old girl from Colorado with scoliosis. Gasol also has a broad range of intellectual and cultural interests. He has taught himself Italian and French to go along with his childhood languages of Catalan and Spanish plus English. While with the Lakers, he and Kobe Bryant spoke to one another during games in Spanish to keep opponents from knowing their plans. Gasol also regularly reads historical novels, plays the works of French classical composers on his keyboard, and attends concerts and operas; he is a friend of Spanish tenor Plácido Domingo, and often visits him backstage after performances. His younger brother Marc, who is 216 centimetres (7 ft 1 in) tall and 127 kilograms (280 lb), is also a professional basketball player, currently playing for the Toronto Raptors. Marc was drafted by the Los Angeles Lakers, 48th overall, in the 2007 NBA draft and his rights were traded to the Memphis Grizzlies, as part of the deal that sent Gasol to the Lakers. Their youngest brother Adrià played for Lausanne's basketball team; his coach at Lausanne said, "He's built like Pau, with a mean streak like Marc", although he was not at the time considered a major basketball prospect. After returning to Spain for his final two years of high school basketball, Adrià enrolled at University of California, Los Angeles (UCLA) in August 2012 and joined the UCLA basketball team as a walk on. Gasol denied false reports that he had broken up with his girlfriend, Silvia López Castro, in the exit interviews after his poor performance in the 2011 NBA Playoffs. ^ "Memphis Grizzlies Career Leaders". Basketball-Reference.com. Retrieved May 17, 2008. ^ a b c d "Pau Gasol's Official Web Site". Nike. Retrieved May 17, 2008. ^ a b "NBA Draft 2001 – Pau Gasol". NBA. Retrieved May 18, 2008. ^ a b acb.com Historial estadístico Gasol, Pau (in Spanish). ^ "2001 NBA Draft Board". NBA. Retrieved May 19, 2008. ^ Newberry, Paul. "Abdur-Rahim Heading Home". NBA. Retrieved May 17, 2008. ^ "Pau Gasol – 2001–2002 Rookie of the Year". NBA. Retrieved May 19, 2008. ^ "All-Rookie Teams". NBA. Retrieved May 19, 2008. ^ a b "Pau Gasol Career Stats Page". NBA. Retrieved May 18, 2008. ^ "Grizzlies Sign Pau Gasol to a Multi-Year Contract Extension". NBA. Retrieved May 18, 2008. ^ a b c d e f g h i j k "Pau Gasol Info Page". NBA. Retrieved May 17, 2008. ^ "NBA Playoffs 2004". Retrieved May 17, 2008. ^ "NBA Playoffs 2005". Retrieved May 17, 2008. ^ "NBA Playoffs 2006". Retrieved May 17, 2008. ^ a b "Pau Gasol Named Western Conference All-Star Reserve". Archived from the original on May 21, 2008. Retrieved May 17, 2008. ^ "Gasol accurately attacks from field; Grizz win only third of last 10". Retrieved May 17, 2005. ^ "Grizzlies at Jazz Boxscore 2007-01-24". Retrieved January 24, 2007. ^ a b "What were the Grizzlies Thinking?". January 17, 2008. ^ "Memphis Grizzlies Franchise Leaders". Retrieved May 17, 2008. ^ a b "ESPN – In dire need of frontcourt help, Lakers acquire Gasol from Grizzlies – NBA". Retrieved May 17, 2008. ^ "Gasol dealt to Lakers in blockbuster trade". Retrieved February 1, 2008. ^ "Paul's double-double helps Hornets prevail". Retrieved May 17, 2008. ^ "Lakers' Gasol to sit out at least three games with injured ankle". Retrieved May 17, 2005. ^ a b "Gasol contributes 10 points in Lakers' win over Portland". Retrieved May 17, 2008. ^ a b Moore, David (May 7, 2008). "Gasol quickly fits in to help Lakers". USA Today. Retrieved May 17, 2008. ^ "Lakers-Nuggets Box Score". basketballreference.com. ^ "Jazz-Lakers Box Score". basketballreference.com. ^ "Lakers Win Series 4–2". Retrieved May 17, 2008. ^ "Lakers-Spurs Box Score". basketballreference.com. ^ "Pau Gasol becomes first Spaniard to reach an NBA final". thinkspain.com. Retrieved May 30, 2008. ^ "2008 NBA Finals Composite Box Score". basketballreference.com. ^ "NBA Finals 2008 Homepage". Retrieved November 10, 2008. ^ "2007–08 Los Angeles Lakers Stats". basketballreference.com. ^ Turner, Broderick (December 24, 2009). "Lakers' Pau Gasol signs three-year extension". Los Angeles Times. Retrieved May 22, 2010. ^ "Los Angeles Lakers vs. Oklahoma City Thunder – Recap – April 30, 2010 ". ESPN. April 30, 2010. Retrieved September 19, 2011. ^ Brian, Kamenetzky (November 1, 2010). "Pau Gasol tops Western Conference". ESPN. Retrieved November 10, 2010. ^ a b Champlin, Brian. "Player Report Card: Pau Gasol". lakersnation. Retrieved May 14, 2011. ^ Medina, Mark (May 12, 2011). "Kobe Bryant named to All-NBA first team; Pau Gasol makes second team". The Los Angeles Times. Retrieved May 14, 2011. ^ a b c Medina, Mark (May 12, 2011). "Pau Gasol has plenty of motivation in off-season". The New York Times. Retrieved May 14, 2011. ^ Deveney, Sean (March 20, 2012). "Pau Gasol says he's ready to take co-captain mantle from departed Derek Fisher". SportingNews.com. Archived from the original on January 30, 2013. ^ "Pau Gasol Awarded NBA's Season Long Community Assist Award". Los Angeles Lakers. Retrieved March 3, 2014. ^ Golliver, Ben (December 4, 2012). "Lakers reportedly tell Gasol to adjust to D'Antoni's system or face trade". SI.com. Archived from the original on December 5, 2012. ^ a b McMenamin, Dave (December 4, 2012). "Lakers F Pau Gasol out Tuesday". ESPN. Archived from the original on December 5, 2012. ^ Shelburne, Ramona (November 24, 2012). "Mike D'Antoni looks at offense". ESPN. Archived from the original on November 25, 2012. ^ Shelburne, Ramona (December 10, 2012). "Lakers, Gasol still searching for fit". ESPN. Archived from the original on December 11, 2012. ^ Bolch, Ben (December 18, 2012). "Lakers hang on to edge Bobcats, 101–100". Los Angeles Times. Retrieved December 19, 2012. ^ Shelburne, Ramona (December 18, 2012). "Pau Gasol to start vs. Bobcats". ESPN. Retrieved December 19, 2012. ^ Pincus, Eric (December 27, 2012). "Pau Gasol diagnosed with plantar fasciitis". Los Angeles Times. Archived from the original on February 6, 2013. ^ Elliot, Helene (December 28, 2012). "Pau Gasol shows his versatility in Laker win over Portland". Los Angeles Times. Archived from the original on February 6, 2013. ^ Pincus, Eric (January 6, 2013). "GM Mitch Kupchak tells fans he's disappointed in team". Los Angeles Times. Archived from the original on January 7, 2013. ^ McMenamin, Dave (January 7, 2013). "Dwight Howard, Pau Gasol out". ESPN. Retrieved January 7, 2013. ^ a b McMenamin, Dave (January 18, 2013). "Pau Gasol may come off bench". ESPN. Archived from the original on January 22, 2013. ^ McMenamin, Dave (January 21, 2013). "Gasol gets his touches, and Kobe's happy". ESPN. Archived from the original on January 23, 2013. ^ McMenamin, Dave (January 22, 2013). "Pau Gasol to be reserve for Lakers". ESPN. Archived from the original on January 22, 2013. ^ "Pau Gasol has tear in plantar fascia". ESPN. February 6, 2013. Archived from the original on February 6, 2013. ^ Pincus, Eric (March 23, 2013). "Trevor Ariza bests his former teammate Kobe Bryant". Los Angeles Times. Archived from the original on April 10, 2013. ^ a b c d Trudell, Mike (April 10, 2013). "Gasol Returning To Form". Lakers.com. Archived from the original on April 11, 2013. ^ Pincus, Eric (March 20, 2013). "Lakers' Kobe Bryant, Pau Gasol 'hopefully' to play Friday". Los Angeles Times. Archived from the original on April 11, 2013. ^ Pincus, Eric (March 26, 2013). "Reintegrating Pau Gasol has made the Lakers vulnerable". Los Angeles Times. Archived from the original on April 10, 2013. ^ Rohlin, Melissa (April 10, 2013). "Kobe Bryant makes Lakers give it to Pau Gasol". Los Angeles Times. Archived from the original on April 11, 2013. ^ Nowell, Danny (April 11, 2013). "Lakers Majoring In Drama For This Playoff Push". ESPN. Archived from the original on April 11, 2013. ^ a b Bolch, Ben (April 28, 2013). "Lakers' Pau Gasol is steady as he goes ... away?". Los Angeles Times. Archived from the original on May 5, 2013. ^ McMenamin, Dave (January 4, 2014). "D'Antoni leans on Pau Gasol". ESPN. Archived from the original on January 5, 2014. ^ "Bulls sign forward/center Pau Gasol". NBA.com. Turner Sports Interactive, Inc. July 18, 2014. Retrieved July 18, 2014. ^ "Bulls sign Spaniards Gasol, Mirotic". NBA.com. Turner Sports Interactive, Inc. July 18, 2014. Retrieved July 19, 2014. ^ "Rose leads Bulls over Nuggets 106–101". NBA.com. Turner Sports Interactive, Inc. January 1, 2015. Retrieved January 2, 2015. ^ "Gasol powers Bulls past Bucks, 95–87". NBA.com. Turner Sports Interactive, Inc. January 10, 2015. Retrieved January 11, 2015. ^ "SPURS SIGN PAU GASOL". NBA.com. July 14, 2016. Retrieved July 14, 2016. ^ "Gasol's season-high 21 points help Spurs end home skid". ESPN.com. November 11, 2016. Retrieved November 11, 2016. ^ "Spurs center Pau Gasol breaks finger during pregame warmups". NBA.com. January 19, 2017. Retrieved January 21, 2017. ^ "PAU GASOL INJURY UPDATE". NBA.com. January 20, 2017. Retrieved January 21, 2017. ^ "Spurs kick off rust from layoff to beat Clippers 105–97". ESPN.com. February 24, 2017. Retrieved February 25, 2017. ^ "Hayward scores 14, Jazz beat Spurs 101–97". ESPN.com. April 12, 2017. Retrieved April 13, 2017. ^ "Spurs' Gasol becomes late addition to 20,000-point club". expressnews.com. April 13, 2017. Retrieved April 14, 2017. ^ "Aldridge, Gasol lead Spurs to 93–91 win over Trail Blazers". ESPN.com. December 20, 2017. Retrieved December 20, 2017. ^ "Spurs bounce back behind Aldridge, beat Kings 108–99". ESPN.com. December 23, 2017. Retrieved December 23, 2017. ^ NBA (December 23, 2017). "Pau Gasol recorded his 10th career triple..." Twitter. Retrieved December 23, 2017. ^ "Leonard, Aldridge lead healthy Spurs past Nets, 109–97". ESPN.com. December 26, 2017. Retrieved December 26, 2017. ^ "Sixers beat Spurs 97–78, end 13-game skid in San Antonio". ESPN.com. January 26, 2018. Retrieved January 26, 2018. ^ "Giannis returns, Bucks hold on for 106–103 win over Spurs". ESPN.com. March 25, 2018. Retrieved March 26, 2018. ^ "Pau Gasol 2018–19 Game Log". Basketball-Reference.com. Retrieved January 1, 2019. ^ "Spurs scored 46 in third to race past Celtics, 120–111". ESPN.com. December 31, 2018. Retrieved January 1, 2019. ^ "SPURS AND PAU GASOL REACH BUYOUT AGREEMENT". NBA.com. March 1, 2019. Retrieved March 2, 2019. ^ "Bucks Sign Six-Time All-Star Pau Gasol". NBA.com. March 3, 2019. Retrieved March 3, 2019. ^ Andrews, Malika (March 23, 2019). "Sources: Gasol (ankle) expected to miss month". ESPN.com. Retrieved March 23, 2019. ^ "Selección: Pau Gasol" (in Spanish). Spanish Basketball Federation. Retrieved December 7, 2012. ^ "Baloncesto – Europeo'01: España" (in Spanish). Terra España. August 31, 2001. Retrieved December 7, 2012. ^ Wilkinson, Simon (September 3, 2006). "FIBA – Gasol named MVP, headlines All-Tournament Team". FIBA. Retrieved December 7, 2012. ^ "Spain crowned kings of EuroBasket". BBC Sport. September 20, 2009. Retrieved September 21, 2009. ^ "FIBA Archive: Pau Gasol". FIBA. Retrieved December 7, 2012. ^ "2004 Summer Olympics: Points Leaders". FIBA. Retrieved December 7, 2012. 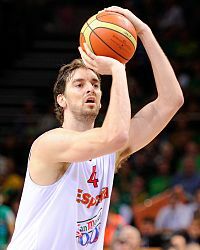 ^ "Gasol will be Spain's flag bearer at Olympics". Yahoo!. July 7, 2012. ^ "Irving named MVP of 2014 FIBA Basketball World Cup, headlines All-Star Five". FIBA. March 14, 2014. Retrieved March 15, 2014. ^ "Gasol named MVP of Eurobasket 2015". Eurobasket2015. September 20, 2015. Archived from the original on September 23, 2015. Retrieved September 20, 2015. ^ "Gasol EuroBasket 2015 statistics". Eurobasket2015. September 20, 2015. Retrieved September 20, 2015. ^ "Pau Gasol passes Tony Parker to take FIBA EuroBasket's all-time scoring mark". NBA.com. Retrieved September 7, 2017. ^ "Pau Gasol joins rare NBA company with 20,000th career point". sportingnews.com. April 12, 2017. Retrieved April 14, 2017. ^ Jenkins, Lee (March 29, 2010). "The power of Pau". Sports Illustrated. p. 2. Retrieved March 26, 2010. ^ a b c d Jenkins, Lee (March 29, 2010). "The power of Pau". Sports Illustrated. p. 3. Retrieved March 26, 2010. ^ "The Power Of Pau". CNN. March 29, 2010. ^ "Pau Gasol Más perfiles" (in Spanish). Retrieved July 6, 2005. ^ a b c d Jenkins, Lee (March 29, 2010). "The power of Pau". Sports Illustrated. p. 1. Retrieved March 26, 2010. ^ Friend, Tom (August 6, 2010). "Dr. Gasol? Pau's love outside basketball". ESPN. Retrieved August 7, 2010. ^ Eisenberg, Jeff (August 17, 2012). "Adria Gasol, younger brother of Pau and Marc, will walk-on at UCLA". The Dagger. Yahoo! Sports. Retrieved August 22, 2012. ^ "2012–13 UCLA Men's Basketball Roster" (PDF). grfx.cstv.com. Archived (PDF) from the original on November 17, 2012. Emanuel David Ginóbili is an Argentine retired professional basketball player. Over a 23-season professional career, he became one of only two players to have won a EuroLeague title, an NBA championship, and an Olympic gold medal. A four-time NBA champion, Ginóbili was a member of the San Antonio Spurs for his entire NBA career. Along with Spurs teammates Tim Duncan and Tony Parker, he was known as one of the "Big Three." Zachary McKenley Randolph is an American professional basketball player who recently played for the Sacramento Kings of the National Basketball Association (NBA). Nicknamed Z-Bo, the two-time NBA All-Star played college basketball for Michigan State University before being drafted in the 2001 NBA draft by the Portland Trail Blazers. 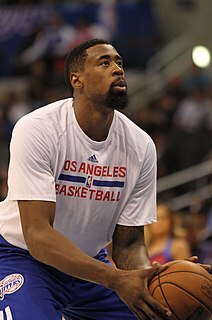 He has played for six teams over the course of his professional career, making the All-NBA Third Team in 2011 with the Grizzlies. Boris Babacar Diaw-Riffiod, better known as Boris Diaw, is a French retired professional basketball player who last played for Levallois Metropolitans of the LNB Pro A. Diaw, who began his professional career in Pro A, returned to that league after 14 seasons in the National Basketball Association (NBA). He plays mostly at power forward. In 2006, Diaw was named the NBA's Most Improved Player as a member of the Phoenix Suns. He won an NBA championship with the San Antonio Spurs in 2014. Ricard Rubio i Vives is a Spanish professional basketball player for the Utah Jazz of the National Basketball Association (NBA). Rubio became the youngest player ever to play in the Spanish ACB League on October 15, 2005, at age 14. He made his EuroLeague debut on October 24, 2006, at age 16, becoming the first player born in the 1990s to play in a EuroLeague game. He is the fifth-youngest player to make their debut in the EuroLeague, since the year 2000. On June 25, 2009, he was drafted with the fifth pick in the first round of the 2009 NBA draft by the Timberwolves, making him the first player born in the 1990s to be drafted by the NBA. The Timberwolves had an agreement in principle with his former Spanish team, DKV Joventut, to buy out his contract, but Rubio backed out of the deal. On August 31, 2009, Joventut traded the rights to Rubio to FC Barcelona, and Rubio signed a six-year contract with FC Barcelona the following day. In 2011, Rubio joined the Minnesota Timberwolves, and spent six seasons in Minnesota before being traded to the Jazz in June 2017. Rodolfo "Rudy" Fernández Farrés is a Spanish professional basketball player who plays for Real Madrid of the Liga ACB. He is a 6 ft 5 in (1.96 m) tall shooting guard and small forward. He is a three-time All-EuroLeague Team selection and won the EuroLeague title in 2015 and 2018. During his stint in the NBA, he was an NBA All-Rookie Second Team member. The FIBA EuroBasket 2009 was the 36th FIBA EuroBasket, the biennial regional basketball championship contested by European nations and held by FIBA Europe. The tournament, which was hosted by Poland, began on 7 September 2009 and concluded with the final on 20 September 2009. The competition served as a qualification tournament for the 2010 FIBA World Championship in Turkey. Mirza Teletović is a Bosnian former professional basketball player who spent six seasons in the National Basketball Association (NBA). He also represented and captained the Bosnia and Herzegovina national basketball team. Standing at 6 ft 9 in (2.06 m), he played at the power forward position. Aron John Baynes is a New Zealand-born Australian professional basketball player for the Boston Celtics of the National Basketball Association (NBA). He played college basketball for Washington State University before starting his professional career in Europe. In 2013, he joined the San Antonio Spurs, and a year later, won an NBA championship with the Spurs. In 2015, he joined the Detroit Pistons. After two seasons with the Pistons, he joined the Celtics. Baynes also plays for the Australian national team. Rodrigue "Roddy" Beaubois is a French professional basketball player for Anadolu Efes of the Basketbol Süper Ligi (BSL) and the EuroLeague. Rudy Gobert-Bourgarel is a French professional basketball player for the Utah Jazz of the National Basketball Association (NBA). He also represents the French national basketball team in the international competitions. Standing at 7 ft 1 in (2.16 m) tall with a wingspan of 7 ft 9 in (2.36 m) long, he plays at the center position. He was the NBA blocks leader in the 2016–17 season, and was named an All-NBA Team member that season as well.